This article will walk you through using the VirtualShield Windows Application. If you don't have it installed already, please click here to learn how to install it. Note: If you can't find the icon on your Desktop, you can also launch the app by opening your Start menu, then navigating to 'All Apps/Programs > VirtualShield'. Great! You are now logged in. You won't need to login again unless you decide to log out first. After signing in, you will see the VirtualShield main screen. 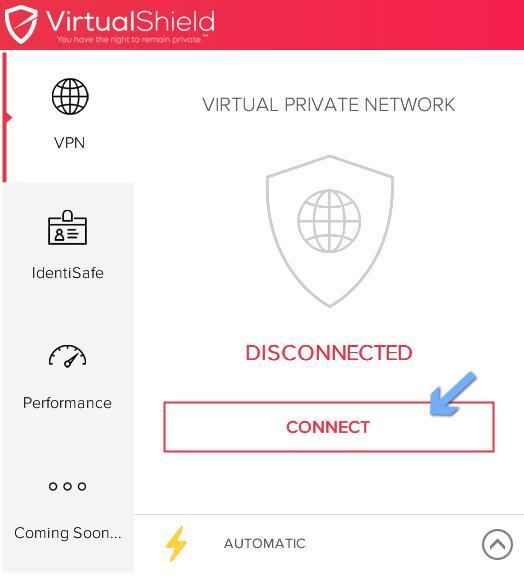 Now that you are logged in, any time you want to connect to VirtualShield you just have to open the app. Remember, there's already an icon placed on your Windows Desktop for easy access. Note: Clicking the 'X' button will not close the application entirely. Instead, it will be sent to your System Tray (next to your clock) and continue running in the background. Just click on this icon to open VirtualShield. This option can be disabled at any time from the General Settings screen. Once you open the app, you will be taken to the VirtualShield main screen. Simply click Connect to automatically connect to our secure network. To learn more about the new Identity Safe features available on Windows computers, see our Using IdentiSafe articles.